On Sheikh Mohammad Abdullah’s birth anniversary (December 5), historian Ashiq Hussian Bhat studies Aatash-e-Chinar afresh to conclude that Sher-e-Kashmir had committed himself to Delhi much before he started resisting it. Sheikh Mohammad Abdullah coming out of Jammu jail before returning to power. Partition of British India had far-reaching consequences for princely states. They lost their identity as the political face of subcontinent changed. However, it affected Kashmir drastically due to the anomalous award of Muslim majority Gurdaspur (Punjab) to India against the very principle of the partition that British had prescribed. 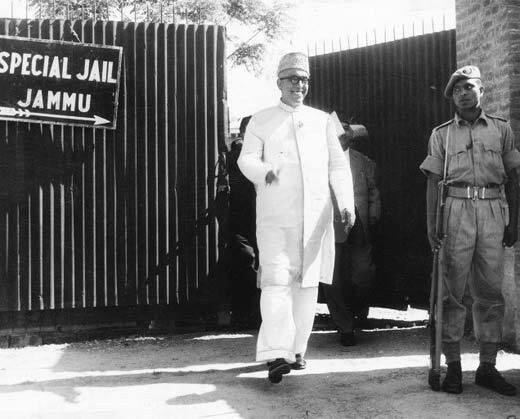 At the time of Partition in August 1947 the most popular leader of the strongest political party of Kashmir, Shiekh Mohammad Abdullah was in jail serving a sentence for challenging the Maharaja’s right to rule. Prompted by the award of Gurdaspur which furnished the only road link between Delhi and Kashmir, he decided to support India rather than Pakistan (p 376 Aatash-i-Chinar Sheikh Mohammad Abdullah). He rejected, so to say, the Two Nations Theory of Quaid-i-Azam Mohammad Ali Jinnah. On the contrary, he embraced the ‘secular nationalism’ as was propounded by Mohandas Karamchand Gandhi. And he went a step further. He apologized, not once but twice, to his ‘beloved’ king, Maharaja Hari Singh, for his “unruly behaviour” of the previous year. On September 13, 1947, he went to the palace, sought forgiveness and presented a gold coin to the king as a sign of loyalty (p 386 Aatash-i-Chinar ). On September 26, he sent a letter of apology to Hari Singh (p130 Sardar Patel’s Correspondence Vol I). If Gurdaspur district had been awarded to Pakistan Sheikh Abdullah would not do all this. Apparently, Sheikh was opposed to Two Nations Theory. Yet he patronized Plebiscite Movement from 1955 to 1972. However, he desisted from becoming a member of the Front which his right-hand-man, Mirza Afzal Beg, set up in 1955. And when the latter dissolved Plebiscite Front in 1975 to revive National Conference in its place he (Sheikh) lost no time to take its membership (p 662 and 853-54 Aatash-i-Chinar ). For about one and a half decade he clamoured for the plebiscite, in which he never believed. In 1972 he declared that he never differed with India on the question of fact of the accession of Kashmir to India but only on the question of quantum of accession (p 835 Aatash-i-Chinar). In 1953 had Prime Minister Nehru assured him that no effort would be made to reduce his powers from Prime Ministership of Kashmir State to that of Chief Minister, he would not talk of the plebiscite. During his Prime Ministership between November 1947 and August 1953, Sheikh put himself as a hurdle in the conduct of the plebiscite. In January 1949 the UNCIP required him to resign to make way for the appointment of UN Plebiscite Administrator. He refused. In 1950 when UN Mediator Sir Owen Dixon submitted his plan (p 486 Aatash-i-Chinar), he again turned it down. Sheikh refused to resign again in March 1953 when UN Mediator Frank Graham submitted his last report (p 563-64 Aatash-i-Chinar). The moment he was out of power he started talking of the plebiscite. Sheikh would say one thing in open and something else when there was nobody to confront him. He launched Quit Kashmir Movement openly and apologized for it secretly. In 1932, when he had recently entered politics, he told Muslims that there was an urgent need to set up a Muslim political organization (p156 Aatash-i-Chinar). But he secretly met Prem Nath Bazaz at Chashma Shahi and promised him to work for the establishment of a joint Hindu-Muslim secular organization (p 212 Aatash-i-Chinar ). Post-1972 while he still paid lip service to plebiscite he secretly met P N Haksar and Mrs Indira Gandhi and promised them his loyalty (p 836 Aatash-i-Chinar ). Under his leadership, Muslim Conference was set up in October 1932 to politically guide Muslims. But he was immediately influenced by Kashmiri Pandits. Under their influence, he collaborated in 1934 with Maharaja’s government by first refusing to support boycott call of Muslim Conference (p 190-91 Aatash-i-Chinar). After pro-boycott elements were jailed, he led the ragtag remnants of the party to take a vigorous part in the election to Praja Sabha, Maharaja’s Peoples Assembly. The Sabha was a sham and a device to hoodwink the world (p208 Aatash-i-Chinar ). Under the influence of political adversaries of Muslims, he disbanded Muslim Conference to set up National Conference (NC) in 1938-39. Now it was natural that he and his party should openly play second fiddle to Maharaja’s despotism. NC was, from its very inception, an affiliate of a larger organization called the All-India States Peoples Conference (p327 Aatash-i-Chinar). AISPC, set up by Pandit Nehru in 1927 for princely states of India, was itself a subsidiary unit of Congress (p227 Aatash-i-Chinar). Therefore, NC and its leader were obligated not to resist Maharaja’s despotism. Gandhi used to say that people of native states should bow down before their Princes (p239 Aatash-i-Chinar). In this way, he converted the political struggle in Kashmir from being anti-Dogra despotism in 1931 to that of a collaborator. The net result was that the Maharaja had his own way. He soon came up with anti-Muslim legislation. He promulgated, in spite of Praja Sabha, the Arms Act 1940 which prohibited Muslims from keeping firearms while as at the same time allowed Hindus to keep them. Sheikh Abdullah’s colleague, Pandit Prem Nath Bazaz, who had played a pivotal role in NC’s establishment, vigorously supported the passage of Arms Act. Maharaja also ordered that Urdu, the state language, should now be written not in Persian script but in Devanagari script. This was a device to banish Urdu and replace it with Sanskritized Hindi. NC did not oppose these measures because it was under firm control of non-Muslims, prominent among them being Sardar Budh Singh, Prem Nath Bazaz, Kashyap Bando and others. Consequently, Sheikh Abdullah’s popularity graph took a hit. In 1944 Jinnah declared Sheikh was unsuitable to lead the people, Muslims and Hindus alike, because of being a double-dealer (p315 Aatash-i-Chinar). He had invited Jinnah himself to Srinagar. When Jinnah gave his verdict, he disgraced his guest in the vilest manner (p11 Democracy Through Intimidation and Terror, P N Bazaz). For speaking against Jinnah and idea of Pakistan, Maharaja rewarded him by facilitating his Party’s entry into the Government. Consequently, Afzal Beg came to be appointed Public Works Minister at a huge monthly salary of Rs 1600 rupees. (p 329 Aatash-i-Chinar). 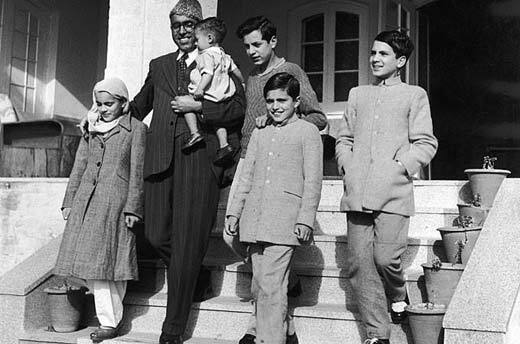 Shiekh Abdullah with his three sons and daughter Khalida Shah. It is his daughter’s son in his lap. Sheikh propounded, at the behest of Pandits, a local variant of nationalism called Kashmiriyat. But, when in 1945 the Maharaja appointed a Kashmiri, Ram Chandra Kak, as Dewan (Prime Minister), Sheikh so resented it that he ordered Afzal Beg to resign forthwith (p 329 Aatash-i-Chinar). Kak’s induction as Dewan became one of the two reasons why Sheikh launched Quit Kashmir Movement next year. The other reason was the issue on May 12, 1946, of Cabinet Mission Memorandum on States Treaties and Lapse of Paramountcy which declared that princely states would be free on British withdrawal from India. Kashmiri Muslims were ignorant about the issue and contents of States Memorandum. On May 12, he came rushing from Lahore to Srinagar and launched on May 15, the Quit Kashmir Movement against Maharaja (p 359 Aatash-i-Chinar). Quit Kashmir sky-rocketed his popularity. If the Maharaja had allowed R C Kak to continue as Prime Minister – (he was dismissed and arrested on August 11, 1947, by Maharaja to please Gandhi and Nehru) – Sheikh would not declare support to post-partition India in spite of award of Gurdaspur. A no-nonsense man, Kak was a strong votary of Kashmir’s independence. Subsequent to Kak’s dismissal, the successful accomplishment of Gudaspur Conspiracy, Sheikh’s changing sides, and Tribal Invasion of Kashmir (of which Pandit Nehru knew one month in advance that it would happen, p 49 Sardar Patel’s Correspondence Vol. I), Indian Army captured Kashmir in the name of saving it from tribesmen. The Maharaja installed Sheikh as Emergency Administrator and later as Prime Minister. Sheikh was never an elected representative of Kashmiris. Prime Minister Nehru foisted him upon Maharaja Hari Singh in November 1947 and Indira Gandhi imposed him on Kashmir in 1975. Although two provincial elections took place in Kashmir during his two tenures and it is doubtful that Kashmiris voted for him. During 1951 Constituent Assembly elections, he did not allow anyone to contest against NC. During 1977 elections he was bedridden. Afzal Beg was his chief campaigner. During election rallies, he pointed his finger towards Pakistan and said they meant to open Rawalpindi Road. Also, he exhibited rock salt and green handkerchief. So it was Pakistani Sarak, Pakistani salt, and Pakistani flag that Kashmiri Muslims saw and voted for. Within a week after Indian Army’s arrival in Kashmir in 1947 India’s Home Minister Sardar Patel, Defence Minister Baldev Singh, and Maharaja Patiala Yadavindra Singh flew to Jammu on November 4 and met Maharaja Hari Singh. Next day Muslims of Jammu city were herded into 40 trucks and machine-gunned at Samba. Sheikh was J&K’s Administrator. Yet the Muslims of Jammu were butchered (p 438 Aatash-i-Chinar). He even took in his cabinet a serial abductor of Muslim women called Baldev Singh Pathania (p 464 Aatash-i-Chinar). Sheikh was a resister at times and collaborator at times, depending upon which way he beheld his self-interest. As a resister, he suffered long periods of incarceration. As a collaborator, he promulgated Public Safety Act 1978-79 to muzzle the voice of his opponents. He even played a double game with NC manifesto. Naya Kashmir manifesto of September 1944 was not what he had published under that title in 1976.